Something the Bible never runs out of is encouragement for the hurting. And hurting can be large or small, long or short and even temporary or permanent. Take a look at some of my favorite KJV Scriptures that I want to share with the hurting. Perhaps they will bless you today or you can bless someone else by sharing them. I pray you are encouraged by God’s Holy Word. This verse hangs over my desk at Selah Mountain Ministries and I often refer to it when I am visiting with someone in the waiting room. It is a very powerful promise and I have seen people (including myself) call out to the LORD when they are hurting. He hears your prayers – He wants you to pray. He desires to hear from His children and He will not ignore you. 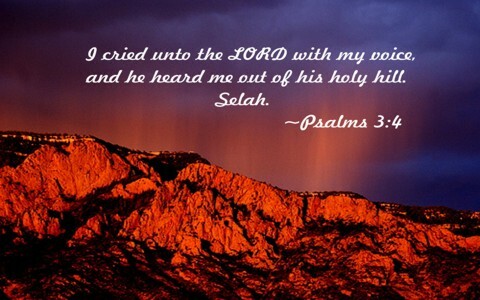 Psalms 34:18 – The LORD [is] nigh unto them that are of a broken heart; and saveth such as be of a contrite spirit. Some great Old English words in this passage. “Nigh” means near to and “contrite” means crushed or broken in spirit. With this in mind, I get a picture of our Heavenly Father Who compels us to draw close to Him when we are in the valley of great hurt and pain. God never fails, leaves nor forsakes us (Deut 31:6; Heb 13:5). He is there to catch you when you fall and when you have fallen into the valley of great despair, this is the best time to call out to the Lord (Psalm 18:6; Jer 33:3). Call to Him; He is waiting to hear from you! Sometimes we forget all about God in the midst of hurt and pain. We forget that He is our great Protector “Jehovah-Roi” and Healer “Jehovah-Rapha” (Psalm 34:8; Ex 15:26). We sometimes get so despondent that we do not know which way to turn. It is easy to dwell in our own secret place, like our dark bedroom, alone in our depression. Rather than hide in our own place we ought to remember that it is the shadow of the Almighty that lifts us out of the pit and allows us to have life and have it abundantly (John 10:10). It’s only temporary! I think these are very, very encouraging words from Romans 8. Sometimes in our misery we must step back and look at it in light of eternity. The wonderful news about this little Scripture verse is that it is in the context of something so great that Paul referred to it as a mystery (Col 1:26-29). That is because of what Christ did for us on the cross at Calvary, we can be adopted into the family of God – joint heirs with Him (Rom 8:16-17). When you consider so great a gift that we have been given, in light of eternity, our present pain and suffering is but a drop in the bucket. I love to look at what Peter wrote as well and compare it with this: “Beloved, think it not strange concerning the fiery trial which is to try you, as though some strange thing happened unto you: But rejoice, inasmuch as ye are partakers of Christ’s sufferings; that, when his glory shall be revealed, ye may be glad also with exceeding joy.” (1 Peter 4:12-13) Consider eternity, focus on the things to come and don’t look back! Philippians 4:7-8 – And the peace of God, which passeth all understanding, shall keep your hearts and minds through Christ Jesus. Be careful for nothing; but in every thing by prayer and supplication with thanksgiving let your requests be made known unto God. In our ministry we refer to this passage as part of the “firestorm prayer”. In the context of Philippians 4:6-9 we encourage folks to memorize this passage so that when they are overcome by the issues of life and become desperate to find peace, they can recall this to mind. David wrote in Psalm 19:14 “Let the words of my mouth, and the meditation of my heart, be acceptable in thy sight, O Lord my strength, and my redeemer.” The way to have the right words in our heart and out of our mouth is to know what the Bible teaches. Spend time reading and memorizing Scripture, you will be so surprised how it is recalled to your mind when you have hidden it in your heart (Psalm 119:11). This passage from Philippians promises peace. When you are hurting you not only need freedom from pain, but you need the peace and comfort that comes only from God – “Jehovah-Shalom”. Just as Romans 8:18 above reminds us of the temporal state of this wicked world in which we live, so does this great and powerful verse from Revelation. Earlier in the chapter John speaks of “a new heaven and a new earth” (Rev 21:1). I am looking forward to that day when I can no longer suffer from the aches and pains that I have in this life. The day when I can retire my trifocals and see clearly the face of my Savior Jesus. The day when there will be no more tears or death or sorrow. This is all because we are on a journey and our permanent home is not earth; our home is Heaven (Phil 3:20) and we are just passing through. There are so many great and wonderful promises in the Bible that we can share with the hurting. I have learned that when I keep my eyes on Jesus, even on hard days, the hurting goes away. And when I keep things in perspective—in light of eternity, this is when I can enjoy an abundant life even on earth. Feel free to add some more verses in the comments that you believe will be helpful to someone whom is hurting. Great encouragement from Scripture Pam! Excellent share Doc … thanks so much! this doc really helped me though all rough things. Previous post: What Does The Bible Teach About Charity? Next post: What Does Wormwood Mean When Used In Revelation?